Anyone use A1's 5-1-1 and/or Gritty mix? Sorry, Punk, I'm not understanding. This is in container gardening, so these are recipes for potting soil? To be mixed with regular potting soil? regular topsoil? What would the mix ratio be? There's nothing organic in either of these mixes. As they stand they might work for bonsai soil, but regular plants will die in them. And bonsai's are pretty much fertilized at every watering because their soil is so inorganic. Why is the lime in there? And yes, unless your 5-1-1 is mixed with potting soil with Miracle Gro or something, the fertilizer will be necessary. Everything you have is nutrient-less. I'm currently getting ready to make some home made potting soil for seedlings. I'm thinking I will use 2 parts coconut coir (peat moss substitute), 2 parts mushroom compost, 1 part perlite, and some worm castings, however much I have available, probably not a whole bunch. 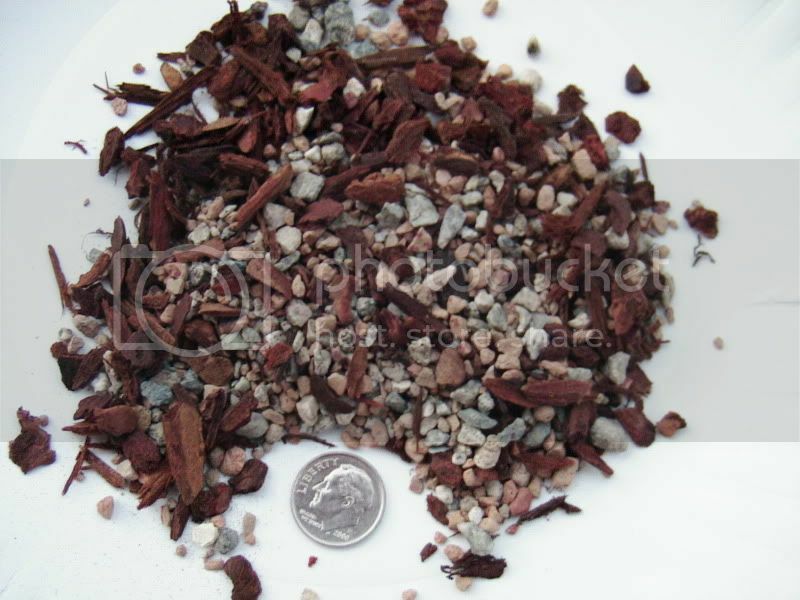 Bark fines are kind of by-product of bonsai growing medium preparation -- what you get when you screen bark mulch to remove the FINEr particles for better drainage. Tarface is oil absorbing garage floor cleanup clay that looks like old fashioned chunky clay cat litter that can be obtained from autoparts store. Tarface is a brand. Some places have no-name or other brands, but apparently Tarface resists breaking down into soggy clay mass, which you DON'T want. In bonsai cultivation, you want immediately draining mix which you water by soaking thoroughly, then don't water again until needed. Hardly any nutrients are in the media and they get leached out by the thorough watering, so you need to fertilize weakly with each watering. OK looking at it more, I think this would be very acidic and you need specific lime amount to neutralize/adjust for one thing. It also looks very moisture retentive with not enough perlite/drainage. I'm thinking fern or tropical plant. -- not seeing it as particularly suitable for peppers, but it may work for blueberries with more drainage -- maybe gritty/sharp Non-alkaline sand -- and actual soil. So many people at gardenweb worship these potting mixes. The guy who made up these mixes says everything pretty much can be grown in it. He says the 5-1-1 lasts only 2-3 years and then loses structure, the gritty mix is for longer term. He does state to fertilize every day very weak or weekly. These mixes are based on high oxygen and fast drainage principles to the root zone. A lot of people swear by the results they get. I am just not sure. I'd love to make my own potting mix and I am hesitant about trying this if others are disagree on its quality. I've never tried them, but I guess it partly depends on if you want to be committed to adding chemical fertilizers constantly. Personally I prefer to do it more naturally, with some kind of organic mixture that will supply nutrients, trace/micro nutrients, soil life to make them usable, etc. That way I don't have to worry about trying to provide everything by hand. Someone just recently wrote in here about a chlorotic plant, that probably had a manganese deficiency. There's a ton of minerals and trace nutrients that plants need. Either you worry about finding synthetic sources for all of those things or you provide an organic base that automatically has them. I also prefer a more organic (and less expensive) "potting mix" but have tried some of this and it works very well. IMO/E, the principle is much more important than specific ingredients or particular ratios. Whether you're using stuff bought in bags at a store, or mixing up some compost from the back yard, soil structure is the key factor to good root structure, function, and health (assuming nutrients levels are appropriately supplied in a nonorganic mix, or exist naturally in an organic mix.) Once I started going in this direction and away from bagged potting mixes in general and peat in particular, I very rarely have a plant that doesn't thrive, let alone die. Whatever you use, if it holds excess moisture, the risk of and ease with which root rot can occur are unacceptably excessive to me. It is the same goal one attempts to achieve when amending clay or sandy ground "dirt" with compost or chopped leaves, improved/moderated drainage/moisture levels. PR, I use a amended 5-1-1 for some herbs and straight up gritty for succulents. It makes total sense with the particle size in a pot. It just takes more maintenance watering and fert's. Will take some pic's when I get a chance. PR, check out Ewings for Turface MVP. They are industrial , but I got some @ a local Ewings 50#for about $12 . O r maybe John Deer's? Most good nursery's have fine fir bark - in So Cal. The grit is the hardest thing to find. I had to got to a roofing contratcor supply house for grit for flat roofing (asphalt grit) . Otherwise check out A-1. Its the size that matters and a pain in *&^% to screen since its granite(heavy). 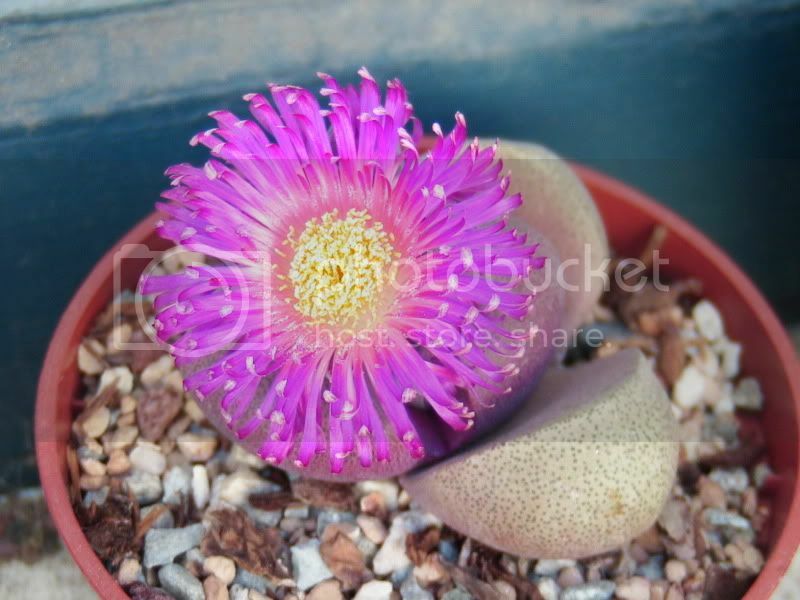 You can substitute with pumice or perlite, I personally like pumice. The work is in the screening of materials. 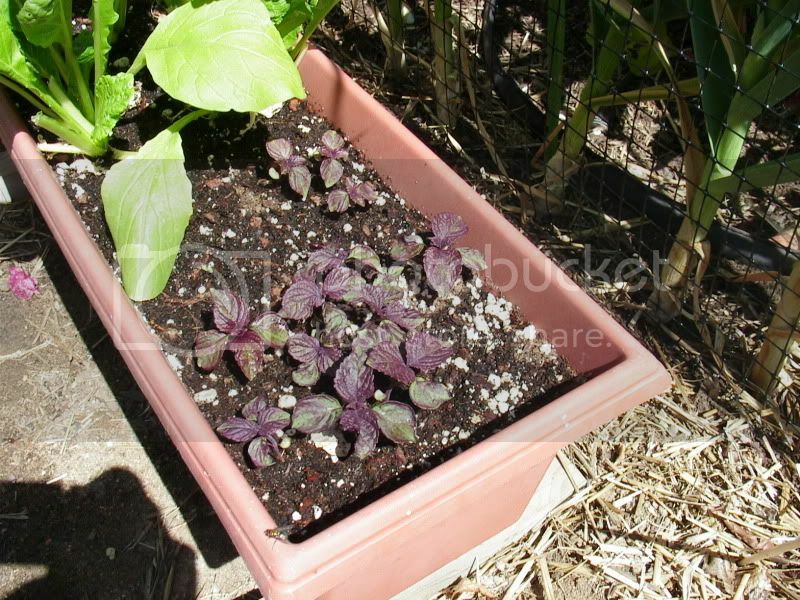 I couldn't find a better picture, but here's a rectangular pot with amended 5-1-1 mix with komatsuna background and aoshiso(red perilla) in the foreground.